For his father, the American artist, see Barry Atwater (painter). Garrett "Barry" Atwater (May 16, 1918 – May 24, 1978) was an American character actor who appeared frequently on television from the 1950s into the 1970s. He was sometimes credited as G.B. Atwater. He appeared on Gunsmoke in 1959, Season 5, Episode 22; The Twilight Zone (1960), Lawman (1962), Voyage to the Bottom of the Sea, Perry Mason, (1959–1965); Mission: Impossible, Bewitched (1966); Star Trek, Mannix (1968); Hawaii Five-0 (1970); Kung Fu (1974); and The Rockford Files (1977). The son of the landscape painter of the same name, Garrett Atwater was born in Denver, Colorado. He served as head of the UCLA Sound Department before he began his acting career. His work teaching audio techniques led to a role in the student film A Time Out of War, a Civil War allegory that won the Oscar as best short film of 1954. Atwater began appearing in television series in the 1950s, often as a primary guest star or as a title character, on episodes of shows such as The Millionaire, Meet McGraw, The Court of Last Resort, One Step Beyond (as Abraham Lincoln), Cheyenne (as George Armstrong Custer), The Rebel, Empire, and Riverboat. By 1960 he had achieved enough stature to be named by host Rod Serling in the on-screen promo as one of the stars of the well-known CBS Twilight Zone episode "The Monsters Are Due on Maple Street". Atwater made six guest appearances on Perry Mason including as Robert Benson in the 1959 episode "The Case of the Dangerous Dowager" and as murder victim Dr. Stuart Logan in the 1965 episode "The Case of the Cheating Chancellor". Atwater also performed regularly on stage throughout his career. Atwater in the mid-1960s spent three years on the ABC soap opera General Hospital while he also made prime-time appearances, billing himself as G.B. Atwater from 1963–1965, a period in which he was cast in supporting parts. By the late 1960s and early 1970s, Atwater was again scoring primary guest-star roles, particularly on fantasy and science fiction series, including The Man From U.N.C.L.E., The Wild Wild West, The Outer Limits, ("Corpus Earthling"), Night Gallery and Kung Fu, where his altered facial appearance suited his grim and sinister countenance due to its menacing and intense appearance. Atwater’s role as vampire Janos Skorzeny (pictured, far right) in the acclaimed TV thriller The Night Stalker (1972) made him a popular guest at 1970s fan gatherings that capitalized on the resurgence of classic horror during that decade. 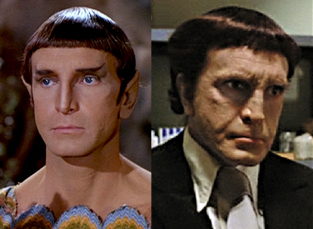 Atwater was one of the few actors to play a character from Spock's planet on Star Trek: The Original Series, portraying Surak, father of Vulcan philosophy, in the episode "The Savage Curtain". Atwater could not achieve the Vulcan salute naturally, so when he bids farewell in a medium shot, he has to first lower his arm so his hand is out of camera view as he pushes his fingers against his body to configure them properly. His final television role was as a gun fence in one scene on The Rockford Files in 1977, with Atwater's character "Roach" interviewed by star James Garner in closeup while he fed pigeons from a park bench. Early in his career, Atwater reportedly used steroids heavily to add bulk to his six-foot-one-inch frame. Suffering from terminal cancer, he died from a stroke on May 24, 1978 in Los Angeles, shortly after his 60th birthday. 1959 Crime and Punishment U.S.A.
1969 Star Trek Surak Episode: "The Savage Curtain"
^ Meehan, Paul (October 20, 2010). Horror Noir: Where Cinema’s Dark Sisters Meet (1st ed.). McFarland. p. 310. ISBN 0786445971. This page was last edited on 28 March 2019, at 00:47 (UTC).